, founder of the Charter-bouse school and hospital, was descended of the ancient family of the Buttons of Lincolnshire, and was born at Knaith, in that county, in 1532. He received the first part of his education at Eton school, whence it is supposed he was sent to Cambridge, and matriculated of St. John’s college, Nov. 27, 1551, but this seems very doubtful, at least there is no direct proof, and his being afterwards a benefactor to Magdalen and Jesus colleges svould incline us to give them the preference, but his name does not occur in the registers of either. He is said to have removed afterwards to Lincolu’s-inn, for the study of the law; but this not suiting his disposition, or what we think extremely probable, his father, and perhaps himself, inclining to the reformation, he evaded the miseries of queen Mary’s reign, by employing almost the whole of that disastrous period in travelling on the continent. 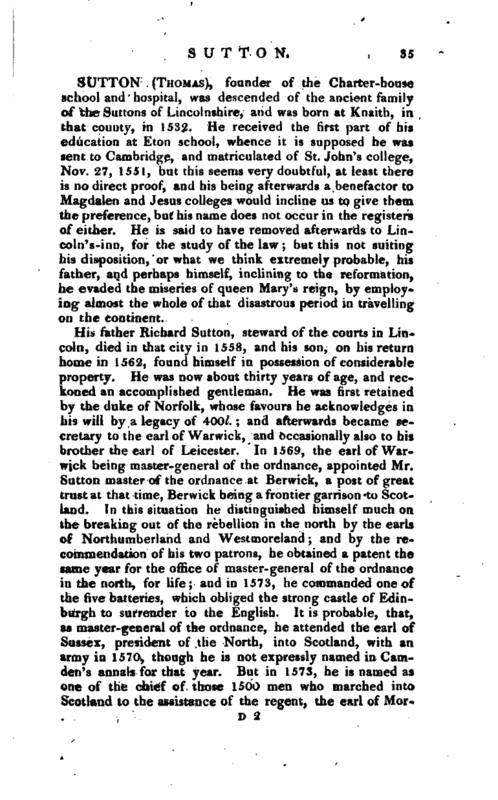 His father Richard Sutton, steward of the courts in Lincoln, died in that city in 1558, and his son, on his return home in 1562, found himself in possession of considerable property. He was now about thirty years of age, and reckoned an accomplished gentleman. He was first retained by the duke of Norfolk, whose favours he acknowledges in his will by a legacy of 400l. ; and afterwards became secretary to the earl of Warwick, and occasionally also to his brother the earl of Leicester. In 1569, the earl of Warwick being master-general of the ordnance, appointed Mr. Sutton master of the ordnance -at Berwick, a post of great trust at that time, Berwick being a frontier garrison to Scotland. In this situation he distinguished himself much on the breaking out of the rebellion in the north by the earls of Northumberland and Westmoreland; and by the recommendation of his two patrons, he obtained a patent the same year for the office of master-general of the ordnance in the north, for life; and in 1573, he commanded one of the five batteries, which obliged the strong castle of Edinburgh to surrender to the English. It is probable, that, as master-tyeneral of the ordnance, he attended the earl of Sussex, president of the North, into Scotland, with an army in 1570, though he is not expressly named in Camden’s annals for that year. But in 1573, he is named as one of the chief of those 1500 men who marched into Scotland to the assistance of the regent, the earl of | Morton, by order of queen Elizabeth, and laid siege to Edinburgh castle. While thus employed in military affairs, it appears that he made a very considerable accession of fortune, by purchasing of the bishop of Durham the manors of Gateshead and VVickham, with their valuable coal-mines, and in 1570 obtained a lease from the crown for the term of seventynine years: and this speculation was so successful, that in ten years afterwards he was reputed to be worth 50,000l. a very great sum in those days. He was not less successful in 1582, when some time after his return to London, he married Elizabeth, daughter of John Gardiner, esq. of Grove-place in the parish of Chalfont St. Giles in Buckinghamshire, and widow of John Dudley of Stoke Newington in Middlesex, esq. 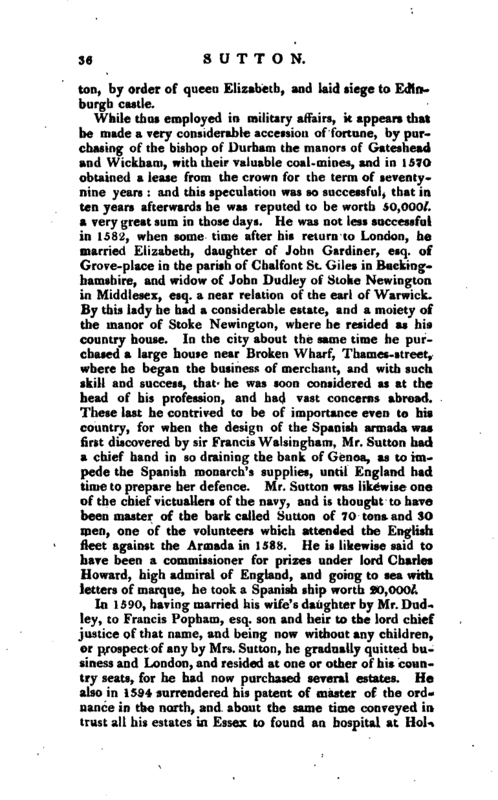 a near relation of the earl of Warwick. By this lady he had a considerable estate, and a moiety of the manor of Stoke Newington, where he resided as his country house. In the city about the same time he purchased a large house near Broken Wharf, Thames-street, where he began the business of merchant, and with such skill and success, that he was soon considered as at the head of his profession, and had vast concerns abroad. These last he contrived to be of importance even to his country, for when the design of the Spanish armada was first discovered by sir Francis Walsingham, Mr. Sutton had a chief hand in so draining the bank of Genoa, as to impede the Spanish monarch’s supplies, until England had time to prepare her defence. Mr. Sutton was likewise one of the chief victuallers of the navy, and is thought to have been master of the bark called Sutton of 70 tons and 3O men, one of the volunteers which attended the English fleet Against the Armada in 1588. He is likewise said to have been a commissioner for prizes under lord Charles Howard, high admiral of England, and going to sea with letters of marque, he took a Spanish ship worth 20,000l. In 1590, having married his wife’s daughter by Mr. Dudley, to Francis Popham, esq. 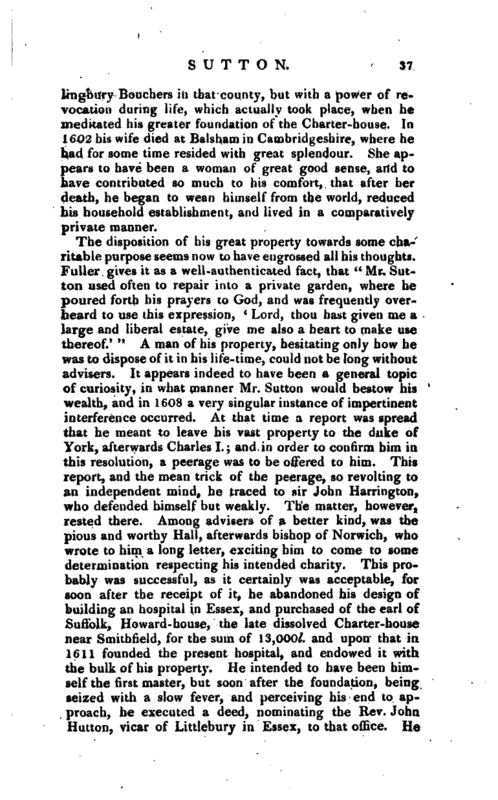 son and heir to the lord chief justice of that name, and being now without any children, or prospect of any by Mrs. Sutton, he gradually quitted business and London, and resided at one or other of his country seats, for he had now purchased several estates. He also in 1594 surrendered his patent of master of the ordnance in the north, and about the same time conveyed in trust all his estates in Essex to found an hospital at | Hollingbury Bouchers in that county, hut with a power of revocation during life, which actually took place, when he meditated his greater foundation of the Charter-house. In 1602 his wife died at Balsham in Cambridgeshire, where he had for some time resided with great splendour. She appears to have been a woman of great good sense, and to have contributed so much to his comfort, that after her death, he began to wean himself from the world, reduced his household establishment, and lived in a comparatively private manner. The disposition of his great property towards some charitable purpose seems now to have engrossed all his thoughts. Fuller gives it as a well-authenticated fact, that “Mr. Sutton used often to repair into a private garden, where he poured forth his prayers to God, and was frequently overheard to use this expression, * Lord, thou hast given me a large and liberal estate, give me also a heart to make use thereof. '” A man of his property, hesitating only how he was to dispose of it in his life-time, could not be long without advisers. It appears indeed to have been a general topic of curiosity, in what manner Mr. Sutton would bestow his wealth, and in 1608 a very singular instance of impertinent interference occurred. At that time a report was spread that he meant to leave his vast property to the duke of York, afterwards Charles I.; and in order to confirm him in this resolution, a peerage was to be offered to him. This report, and the mean trick of the peerage, so revolting to an independent mind, he traced to sir John Harrington, who defended himself but weakly. The matter, however, rested there. Among advisers of a better kind, was the pious and worthy Hall, afterwards bishop of Norwich, who wrote to him a long letter, exciting him to come to some determination respecting his intended charity. This probably was successful, as it certainly was acceptable, for soon after the receipt of it, he abandoned his design of building an hospital in Essex, and purchased of the earl of Suffolk, Howard- house, the late dissolved Charter-house near Smithfield, for the sum of 13,000l. and upon that in 1611 founded the present hospital, and endowed it with the bulk of his property. He intended to have been himself the first master, but soon after the foundation, being seized with a slow fever, and perceiving his end to approach, he executed a deed, nominating the Rev. John Hutton, vicar of Littlebury in Essex, to that office. He | died at Hackney Dec. 12, 1611, and was interred with great magnificence in the chapel of the Charter-house, where a monument was erected to his memory. At his death he was the richest untitled suhject in the kingdom, having in land 5000l. a year, and in money upwards of 60,000l. His will contains many individual legacies of the charitable kind. 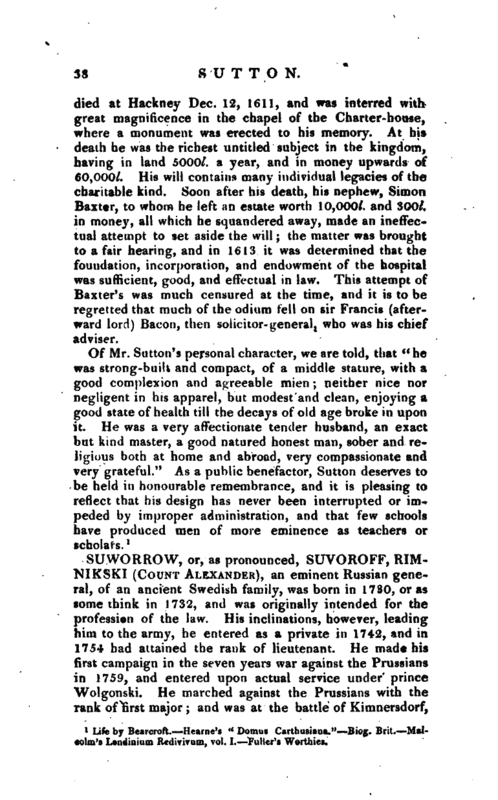 Soon after his death, his nephew, Simon Baxter, to whom he left an estate worth 10,000l. and 300l. in money, all which he squandered away, made an ineffectual attempt to set aside the will; the matter was brought to a fair hearing, and in 1613 it was determined that the foundation, incorporation, and endowment of the hospital was sufficient, good, and effectual in law. This attempt of Baxter’s was much censured at the time, and it is to be regretted that much of the odium fell on sir Francis (afterward lord) Bacon, then solicitor-general, who was his chief adviser. Life by Bearcroft.—Hearne’s “Domus Carthusiana.”—Biog. Brit.—Malcolm’s Londinium Redivivum, vol. I.—Fuller’s Worthies.